Out of the corner of your eye, you watched as Ushijima joined his team at their own, individual bonfire. He was dressed more casually than you were use to, and it was entirely possible it wasn't just the flames making your face burn anymore. His mouth moved incoherently in response to his more outgoing members, the sleeves of his maroon sweater pushed up to his elbows to reveal sculpted, marble like forearms. The two of you were mere acquaintances, only comfortable enough for a polite 'hello' in the morning and a 'good-bye' if you happened to see him. About the only connection you had with him was both your fathers played on the same volleyball team, but you hadn't found that out until your second year and it was awkward to bring it up given the circumstances. Still, you admired him. You would have played volleyball too, but the girls' team was intimidating --if not terrifying. You were a meager, little thing anyway, with more brains than athletic capabilities. "Have you guys heard the rumors about these woods?" You brought your gaze to the nameless first year, brows furrowed incredulously. The mixture of boys and girls in the group reeled in, their gelatinous, white cubes long since forgotten. "What about them?" Another student asked, barely above a whisper. The nameless first year smirked, his eyes narrowed impishly, "It's said that these woods were used to summon demons; more specifically the Goat Man." "Exactly what it sounds like: part man, part goat. Nobody really knows why he was summoned, but when he was he killed every one of his worshipers with an ax from the Underworld. The rumor is that he still roams these woods, some say it can even shift into looking like someone you know. "My brother said that if you stand at the edge of the tree-line and stare into the darkness long enough, you'll hear his cloven hooves approaching and just as you turn your back to run..."
You found yourself inexplicably holding your breath. Your classmate jumped from his chair and bellowed, "He'll get ya!" Several girls in the group shrieked and it caused your own heart to nearly lurch out of your chest. Their screams were ear-piercing, gaining unwanted attention from the other campers, particularly Ushijima's, and you stood to diffuse the situation. "I think that's probably enough ghost stories for tonight." "If you don't believe me, then why don't you try it?" The very idea was enough to send a shiver down your spine, and a single droplet of sweat trickled down your temple. You waved your hand dismissively, "I don't think that's necessary. It's just a silly story, so let's all just try to calm down." "If it's just a story then you have nothing to worry about. Right, senpai?" You swallowed, unable to keep your eyes from meeting the tree line. Curiosity was a deadly lure, tempting you despite the obvious lack of truth as if you were back in grade-school and dared to chant Mary's name from a bathroom mirror. Hypothetically, what if something did happen? 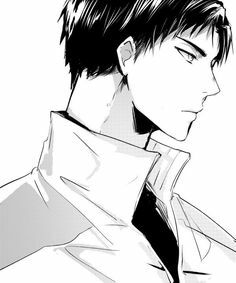 Absentmindedly, you also turned to look at Ushijima and nearly choked to find his stoic gaze already locked on you. The silent stare between him and you was almost as terrifying as staring into decrepit-like branches, and it looked like he was mentally reprimanding you for even considering playing such a childish game. But you could no longer ignore the clucking classmate. You straightened, fingers curled into fist at your sides. You trudged away from the fire, ignoring your group's gasps of astonishment. A couple of students even rose to follow you, albeit keeping their distance. The withered leaves and fallen branches crunched beneath your feet, bringing your anxiety to a whole new level. You hesitated the closer you came to peering into the shadowy depths of the forest and was subsequently shoved by the story-teller. Unbeknownst to you, that was the last straw for Ushijima. He didn't say much, and for that reason he didn't know very much about you, but you were always conveniently in his sight. Always in the same place at the same time, Ushijima learned by watching. Your gentleness and coy interaction with everyone you met made him feel protective of you, he didn't want anyone taking advantage of that. He didn't like seeing anyone uncomfortable (even if the bluntness of his words were a constant cause), but with you he loathed it. You were uneasy with the feeling of eyes on you, but it hadn't occurred to you that it could still be Ushijima. Too caught up by the small group behind you and the eerily still atmosphere inside the maze of branches, he was almost a distant thought. Even without a breeze, the darkness seemed to howl. The amber glow of the fire cast it's light on the closest trunks, and grew dimmer the further your eyes stared into the wilderness. Your mouth twisted into that of either a simple frown or a grimace, your imagination forming something out of nothing. Now was a bad time to remember your fear of the dark. A twig snapped somewhere, and fallen leaves hissed with disturbance. Your spine went rigid, an obscured figure approaching out of thin air. In your mind's eye, you could make out what appeared to be spiraled horns adorning the body of a man, concealed by a haze of campfire smoke. Another, more monstrous snap, presumably under the stomp of a cloven hoof. "A-are you guys seeing this?" You gulped. "Oh my god! What is it?!" A chorus of screams reverberated throughout the woodland and bodies hopelessly, and frantically scattered, flinging themselves to safety... From the volleyball captain that had harmlessly approached from the right. You were so startled by everyone else that you'd tripped over your own feet and fallen back onto your rear. Had it actually been the Goat Man you saw instead of the remnant wisps of clouded fumes curling and wafting in the distance, you would have been the first to die. A large hand reached down to you, and your heart began to hammer for completely different reasons. Ushijima's olive hues were hard on yours, demanding that you take his hand at once. When you did, he pulled you up with an effortless force, only releasing you once he was sure you could retain your balance. A faint blush tinted your cheeks, "Thank you, Wakatoshi." You cleared your throat and forced a tight lipped smile, "Just a little startled, that's all. I'll be okay." "N-no, really, Toshi... I think I'll just go to my tent--"
"[Name]," he grunted and snatched your hand, "Come. Sit. I don't like it when you're scared." He tugged and a warmth much like a bonfire spread through your cheeks. There was no other option but to comply. Not that you really minded. I DON'T KNOW HOW TO WRITE FOR WAKATOSHI! You guys might be laughing at the "Goat Man", but it is the most terrifying urban legend I've heard of. ;u;; thank you so much! that wasn't honestly something I realized or thought about until just now. Lololol, thank you so much! Especially "Ushijima's olive hues were hard on yours, demanding that you take his hand at once." But to be honest, you'd already killed me at "the sleeves of his maroon sweater pushed up to his elbows to reveal sculpted, marble-like forearms." I got it bad where a toned set of forearms is concerned. Ha. I'm not going to look up the lore/myth/stories about Goat Man for reasons buuuut this story is sooo cute! Yay for Ushijima's careful(?) watching! Yeah, don't look it up XD Period. THE NAME ITSELF IS SO DUMB BUT THE PICTURES SCARED THE sH*T OUT OF ME! I KNOW! EITHER PEOPLE ARE FKING CLEVER OR SOMETHING ACTUALLY HAPPENED! THAT SOUNDS AMAZING! PLEASE DO! YOU SHOULD DO IT! DO IIIIIIIITTTTTTT!!!!! The fluff has officially jumped down my throat and is proceeding to choke me. This was so frickin cute. The Ushijima obsession is RA-EEEL right now. You were sad again. Ushijima hated when you were sad because it meant you wouldn't play with him. You wouldn't race bikes or set a volleyball or even play tag. He hated that because you were the only kid left in the neighborhood who still played with him despite the fact that he always won. He always won, but you kept accepting his challenges and you never gave up. You were the only kid he could play with and still have any fun. But when your parents couldn't get their arguments under control, sometimes being loud enough that Ushijima knew they were at it from his own house, and they got you upset, you wouldn't play. Sometimes, you wouldn't even talk to him. You would just sit behind your garden shed, picking at grass and not making eye contact. Ushijima Wakatoshi is not known to immerse himself in any sort of dilemma for long. Yet when he’s locked inside the storage room, with a very scared [Name] by his side, he knows that this is going to be one long encounter. And an unpleasant one at that. A/N: domestic!AUHe stopped what he what he was doing and snapped his gaze towards her, staring and waiting for her to reaffirm what she had just said. When she did nothing but stare back, it told him everything. He felt like he'd just gotten punched in the chest. The air had escaped his lungs and slowed his thoughts to wrap them around the news she just laid on him. Pregnant. This was something he had always feared. Something brought up as a joke or a prank, but since finding her, he supposed that he had settled down a little. Of course the idea of it still petrified him, mentally and physically. He struggled to find words. He knew he had questions but he couldn't even think of how to say them. It was embarrassing really. He never got flustered or stunned, and now he was both at the same time. You waited outside the gym, watching as the coaches walked out of the gym; and the volleyball team that eventually started filtering out too. A sombre atmosphere filled the air as the boys grit their teeth, defeat evident in their eyes. It was a close match; the outcome surprising when Karasuno managed to win against your school. How a team as unheard of as Karasuno could win against Shiratorizawa, you had no idea. But you could tell how distraught the volleyball team was when they lost. The appropriate words of comfort failed to find their way to your lips. You could only offer them a sad smile, rooted to your perch against the wall while they walked past. Your eyes flitted to the ground. A minute passed, and then another. It seemed like eternity until you saw a pair of shoes stepping into your line of vision. 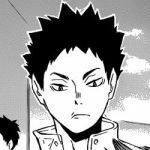 To say Ushjima Wakatoshi was upset when you had decided to go to Karasuno instead of Shiratorizawa was an understatement. It affected him so much he didn’t talk to you for a whole week, which was quite surprising seeing as how the two of you were known to be joined by the hip. Nevertheless, he had to accept your decision even though he’d much rather you continue to attend Shiratorizawa with him. You wanted a new environment. The people in Shiratorizawa were a little too stuck up for your liking, excluding Ushjima of course. You wanted to go somewhere a little smaller and your parents had suggested Karasuno. 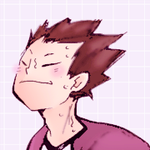 Since you had pretty good grades you were in a college prep class with Daichi and Suga. You became friends with them in no time and they encouraged you to sign up as the volleyball club’s manager. They didn’t know that you had already been planning to do so but you didn’t tell them that.